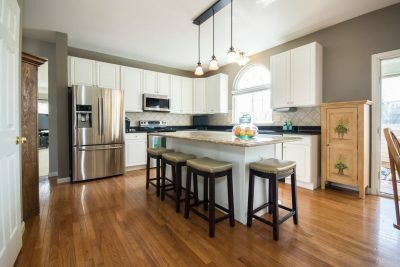 My team and I enjoy the remodel and renovation challenges that we sometimes face as we work on homes, apartments, public buildings, and office complexes throughout the North Shore and Historic North of Boston. 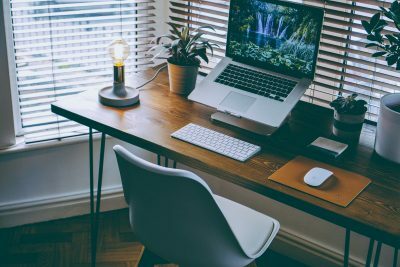 So I thought it might be fun to look back at some of the more out-of-the-ordinary challenges we faced in 2017. 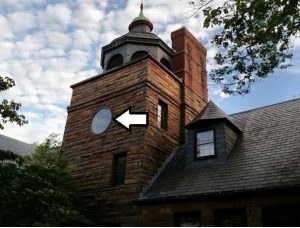 During one of our renovation challenges at the Manchester Library (bottom), we climbed up through the inside of the clock tower to install a new clock frame and glass and then sand and paint the inside of the window. The arrow points to the glass over the clock. We climb roofs a lot to fix and replace skylights, solar panels, and the roofs themselves but this clock tower was a first for us. Then there’s one of our clients in Ipswich who asked if we could rejuvenate their old pergola (middle). We sanded all the slats and coated them with light oak stain. 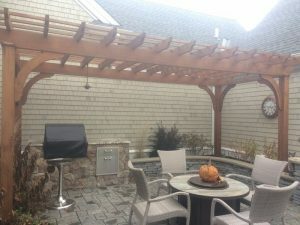 The challenge here was the detail—that pergola has a lot of slats, not all of them visible in the photo. 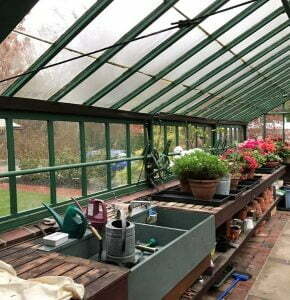 Speaking of a lot of one thing, we were happy to restore the greenhouse in the far left photo, making sure its windows received new brackets and were sanded, repainted, and in some cases replaced. 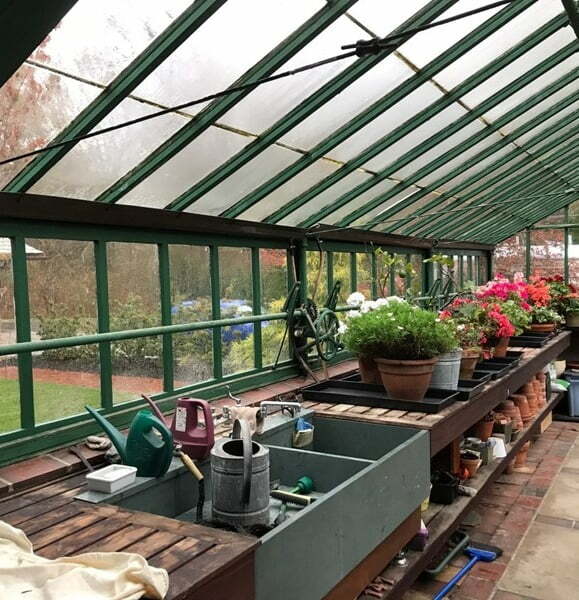 As you can tell from the photo on the far left, the greenhouse is functional once again–a happy ending to another of our renovation challenges.. These are just a few of the interesting and challenging projects that WORKS undertook on the North Shore and Historic North of Boston. But you don’t have to come up with a one-of-a-kind experience to get our attention. 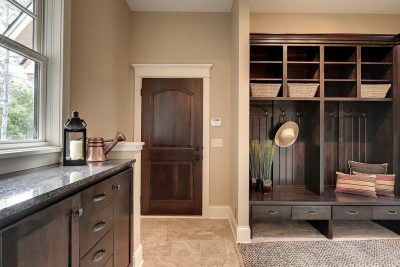 We’re always interested in helping you realize the project of your dreams—a kitchen or bathroom renovation, a new master bedroom or entire accessory apartment, a drip-free roof, a steadier deck, or a better insulated mud room. And of course, if you just happen to have a project with a little extra twist, please contact us. 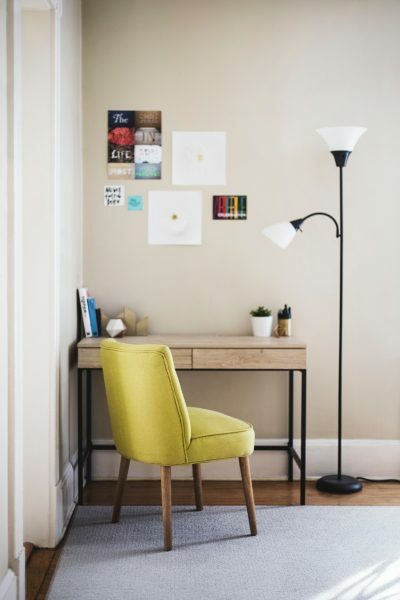 We’re WORKS by Jesse DeBenedictis and we love a renovation challenge.